세안 후 토너로 피부결을 정돈한 후 에센스 단계에서 얼굴 전체에 골고루 적용하여 흡수 시켜 줍니다. [일주일에 1~2회 정도 본 품을 적용한 후 모델링 마스크를 사용하면 시너지 케어에 도움을 줍니다] * 개봉 후에는 가능한 빠른 시일 내에 사용하시기 바랍니다. 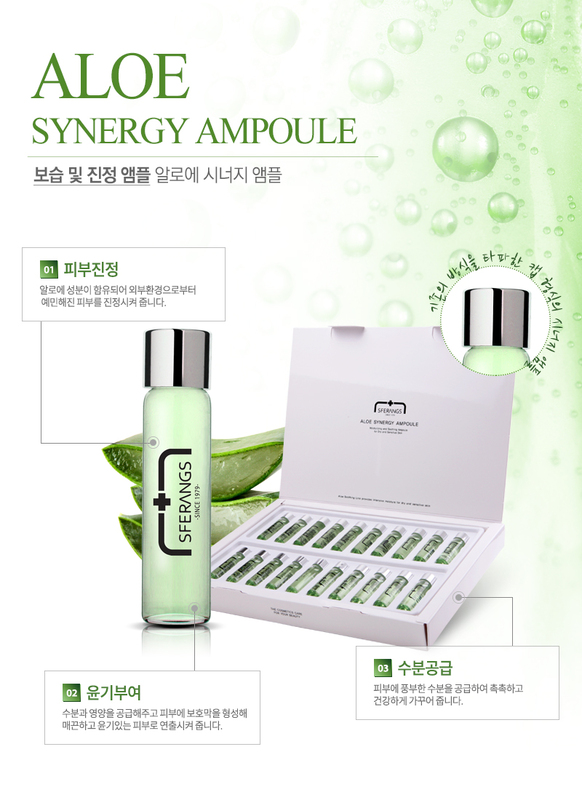 Aloe Synergy Ampoule provides soothing care and recharge dehydrated skin to hydrated skin. DIRECTIONS : After facial wash and toner application, apply small amount of the ampoule at the serum phase. Evenly apply with light pressing motion to all over the face and neck. CAUTION : For external use only. Avoid contact with eyes. Keep out of reach of children. Discontinue use if signs of irritation appear.